Can you confirm these amateur observations of Pituophis deppei? deppei: Mexico (Jalisco, Durango, Coahuila); Type locality: "Mexico"; restricted to San Juan Teotihuacán, state of México, by Smith and Taylor (1950: 334). 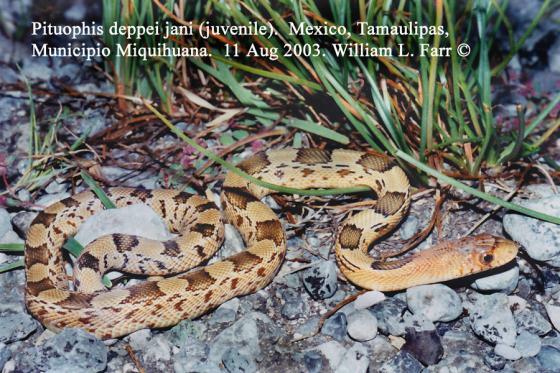 jani: Mexico (Nuevo León, Hidalgo, Coahuila); Type locality: Buenavista, Coahuila. Diagnosis Diagnosis.—This subspecies is characterized by the presence of solid body-blotches and lateral intercalary spots, dorsal interspaces less than five scales in length, and the absence of paired stripes or rows of blotches, on the anterior part of the body. There are 209 to 232 ventrals and 52 to 62 caudals. The body-blotches number 27 to 49. In adults the anterior and posterior body-blotches are black; the lateral intercalary spots are solid black. In many individuals black dashes connect the adjacent corners of the dorsal body-blotches (Pl. 45, Fig. 1). In juveniles the anterior, dorsal body-blotches are black, whereas those at the midbody and posteriorly are brown [from DUELLMAN 1960]. Diagnosis (jani): This subspecies is characterized by solid body-blotches that are black anteriorly and brown posteriorly, anterior dorsal interspaces six or more scales in length, and the absence of dark stripes or rows of spots on the anterior part of the body. There are 215 to 235 ventrals, 52 to 68 caudals, and 21 to 31 dorsal body-blotches. The position of the lateral intercalary spots and lateral streaks are the same as in deppei deppei [from DUELLMAN 1960]. Comment Distribution map in Rodríguez-Robles & De Jesús-Escobar (2000). Subspecies: Dixon et al. (1962) questioned the validity of the two subspecies of P. deppei (P. d. deppei and P. d. jani), whereas Conant (1965) suggested that intergradation or introgression occurred between P. deppei and P. m. affinis in northern Mexico, perhaps implying that P. deppei was not a valid species, a suggestion with which Morafka (1977) agreed. SCHMIDT 1933 ddescribed Pituophis deppei brevilineata from Michoacan whose status is currently unknown as recent authors do not mention this form any more (e.g. LINER 2007). Etymology Named after one of the collectors, Ferdinand Deppe. P. d. jani is named after Giorgio Jan, another European herpetologist.